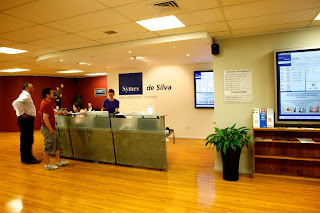 Symes de Silva & Associates dental practice in New Zealand chose Onelan digital signage as the ideal solution to display a wide range of information throughout the practice. Symes de Silva & Associates is an established dental practice located in Wellington, New Zealand. The practice aims to provide the highest standards of dental care available to their clients by offering an extensive range of services and employing modern technology. With nine Dentists, five Hygienists and one Specialist Oral Surgeon, Symes de Silva is a busy practice, open for long hours and seven days a week. Symes de Silva recognised a need to streamline the way in which information is provided and displayed to clients in their busy reception area. Digital signage was chosen to display relevant and up-to-date information to clients and staff. The new signage needed to successfully integrate with Symes de Silva's existing network, have the ability to cope with various content types, refresh instantly and most importantly be easy to use by the many administrators at the practice. · ground floor signage to display the practice's services to passersby on the street. A wide range of content is displayed throughout the practice. The three 50" plasma's in reception provide information to clients arriving and waiting in reception; this includes the names of associates and the services offered, as well as entertainment such as television, news and weather feeds. The ground floor display is directed more towards passers by on the street and includes PowerPoint presentations and information on the practice’s services. Symes de Silva have improved both the efficiency of communicating information to their staff and clients. In addition, by using the digital signage to entertain, the waiting experience for their clients has also greatly improved.